Our coats may still be buried away in the back of our closets, but that’s no reason to abandon characteristically cold weather fare like soup. Think about it — what better way to beat the heat than with a chilled soup made of seasonal fruits and vegetables, like Watermelon Gazpacho topped with Feta Cheese or cold Corn Soup crowned with Crabmeat? Is your mouth watering yet? Check out the creamy Cucumber Vichyssoise at Dovetail, or the sweet and savory Borscht at Joseph Leonard, and it will be. Here are a few other cool soups to savor before summer’s end. One-of-a-kind paintings by Warhol and Picasso aren’t the only reasons to visit the Museum of Modern Art. Overlooking the Rockefeller Sculpture Garden, in-house restaurant The Modern is so much more than your standard museum café. Chef Gabriel Kreuther and Pastry Chef Marc Aumont serve imaginative and refined French dishes, like Muenster and Brie “Souffle,” Quail and Morels with Macaroni Gratine, and Black Current Vacherin. But whether you order the prixe fixe in the formal dining room or a la carte menu at the bar, be sure to start your meal with one of the beautifully composed cold soups, like Tomato and Almond Gazpacho with Cucumber, Cherry Tomatoes and Basil Oil, or Honeydew Melon Soup with Shemogue Oyster, Diver Scallop, and Hackleback Caviar. Provided you can actually get a table at Gabe Stulman’s consistently packed bistro (there are only seven of them), be sure to start your meal with the Chilled Beet Soup, inspired, of course by that Eastern European specialty, Borscht. Although this being the tony West Village, don’t expect a rustic bowl of aggressively stewed beets and beef. Instead, the cool, ruby red emulsion is dotted with house-made rye croutons, and dollops of poppy seed crème fraiche. John Fraser has consistently been awarded with Michelin stars at the elegant Upper West Side restaurant, Dovetail, for his avant-garde, often vegetable inspired cooking (he even offers an entirely meat-free menu on Mondays). Don’t get us wrong… dishes like Colorado Lamb with Spring Onions and Filet Mignon and Leek Wellington are delicious. 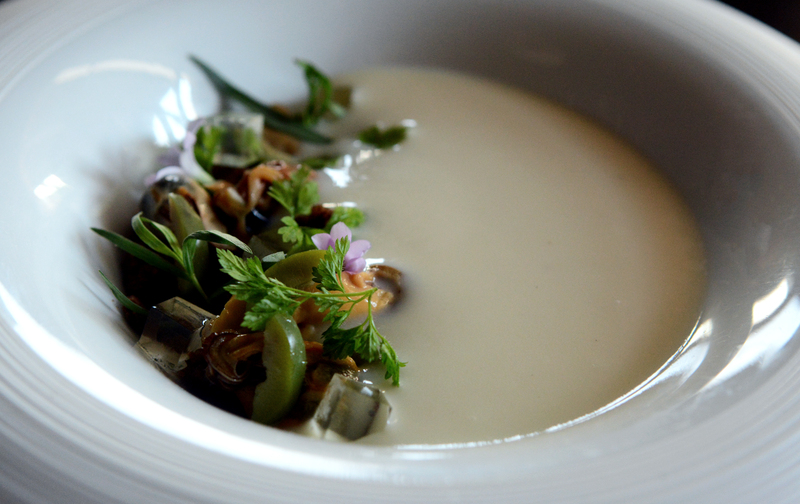 But chilled soups like Cucumber Vichyssoise with pineapple, enoki mushrooms, and peanuts, as well as Asparagus Veloute with green tomatoes and Old Bay are the perfect showcase for gorgeous summer produce. There aren’t exactly a ton of New York restaurants serving New Zealand-inspired fare, so the new eatery The Musket Room has definitely piqued our interest. Chef and owner Matt Lambert marries his Kiwi upbringing with his classical training, producing unique dishes, like New Zealand Red Doe infused with Gin, Grouper with Fried Oysters and Pickled Mussels, and a vibrantly green cold Watercress Soup, which gets poured over a bowl of crispy Sweetbreads and tangy compressed Buttermilk Curds. This year-old Williamsburg restaurant drew raves right out of the gate for Justin Hilbert’s super modern, out-of-the-box fare. It meant that former sous chef Owen Clark had a tough act to follow, when he stepped into the executive chef position just a few months ago. And yes, signature Hilbert items, like the dense and aromatic Whiskey Bread are still available, but it would be a shame to fill up before you get to Clark’s equally enjoyable new menu additions. Take the Duck with golden beets, sprouted wheat and dandelions, and the Vermouth-infused Chilled Potato Soup, sporting bits of smoked mussel, micro lettuces and salty green olive. Just because the ever-popular Gotham Bar & Grill has been around for 25 years doesn’t mean that chef Alfred Portale is resting on his laurels. Yes, signature dishes like Miso-marinated Black Cod and Yellowfin Tuna Tartare remain menu stalwarts, but you’ll also find seasonally-inspired dishes like Striped Bass Ceviche with honeydew and watermelon. Be sure to check out the $25 Greenmarket Prixe Fixe Lunch, which (in addition to being a steal), allows Portale to be especially creative. We’re currently loving the sweet Corn Soup, topped with chanterelle mushrooms, cherry tomatoes, chipotle foam and (if the chef is feeling particularly generous), sometimes even chunks of succulent Maine lobster. While it was originally intended as a casual neighborhood spot, Colonie has quickly become a dinner destination for Brooklyn residents and food-focused Manhattanites alike. And it’s certainly worth traveling to Brooklyn Heights for a bowl of their chilled Heirloom Squash Soup, garnished with tender fried squash blossoms and crumbles of tangy feta — liquid summer! One of the most popular cold soups is undoubtedly Gazpacho, so where better to get it than at an authentic Spanish restaurant? Chef Luis Bollo offers not just one but two different kinds at his attractive Chelsea spot Salinas, including a refreshing Cucumber Gazpacho with garbanzo beans and green heirloom tomatoes, and the more classic Gazpacho Andaluz, made with chopped red and yellow peppers, onions, crispy croutons and cherry tomatoes, tossed in a bowl with shards of frozen tomato juice. Edgy and excellent.